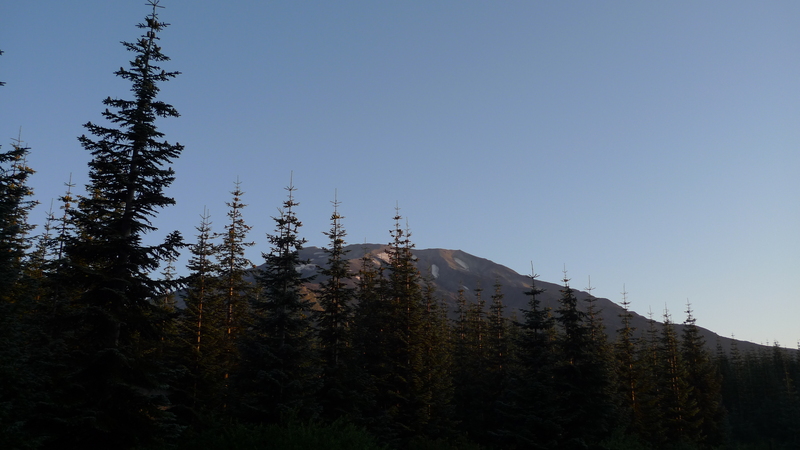 I must admit that my attitude related to climbing the Oregon/Washington peaks has been somewhat ambivalent as chronicled in this blog. As noted in my post from the Adams Climb, I’ve moved slightly up the continuum towards excitement regarding these adventures! That said, I had an opportunity to join my brother and a team of non-technical climbers in their quest to climb (aka conquer) Mt. St. Helens on August 30th! 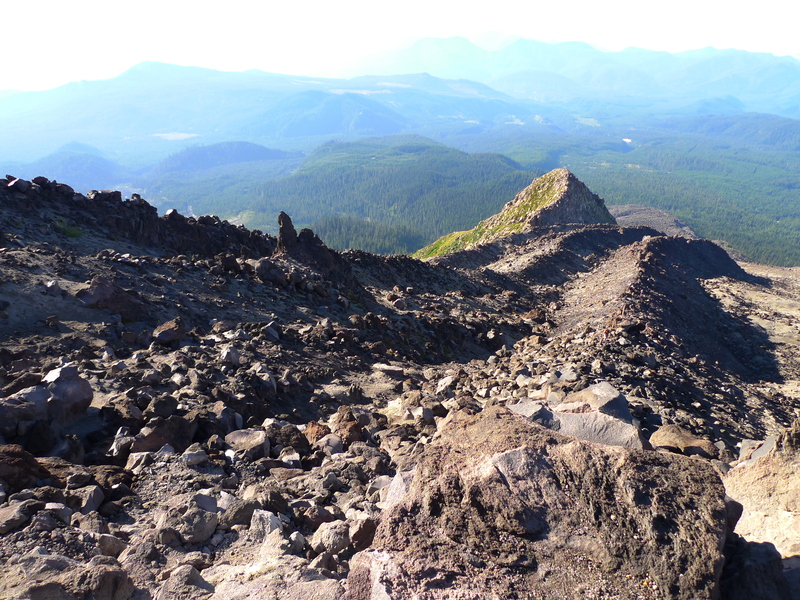 I gladly joined, in spite of input received from Franken regarding climbing the Mountain during the summer months–described as “HELL” due to the huge amount of ash and/or scree near the rim. This would be an opportunity to buck the trend! This adventure started with an 11:30am departure on Saturday from Portland. It’s about a 1.5 hour drive from Portland to Cougar, WA and we arrived around 1pm at the permit location, the Lone Fir Resort. First off, the Lone Fir was killer and I cannot adequately describe how nice the owners were to us and everyone else at the restaurant. They were extremely concerned about the quality of our experience there and identified quickly that my brother was not the most adventurous eater, validating that his simple cheeseburger met his high specifications! While the menu was rather simple, the food was excellent! Here we met our team leaders, Gary and his wife Dixie, before we departed for the Climbers Bivouac. From the Lone Fir, it’s about a fifteen minute drive to the Climbers Bivouac. It’s a mostly paved road from Cougar and our destination was a mere 6 miles from Ape Caves. Mostly. The Bivouac consists of a large loop parking lot with numerous camping spots for aspiring climbers. We selected a site very close to the trailhead that would accommodate a total group size of 11. Numerous circus-variety tents were erected at this location and we prepared for the arrival of the other members of the team. The weather on the Mountain was gloomy on Saturday. We hiked from the Bivouac (elevation 3800ft) to the tree line @ 4700ft and met many hikers along the way. Versus Mt. Adams, these hikers were very happy as they had tamed the mountain, only missing the complete experience of seeing the dome and views of Mt. Hood, Adams, and Rainier due to ~30 yards visibility! Versus, Mt. Adams, these hikers didn’t demonstrate the same level of bitterness, due primarily to the fact that they made it to the rim. This was nice as a pre-hike hike as it’s only 2 miles to the tree line and the elevation gain was extremely gradual! Given that this was car camping, and probably just shy of glamping, the accommodations were not meager. Our climb leader brought a ton of wood for the fire pit in his truck. We had two, two-burner Coleman stoves. My brother’s tent, as an example, had a doggie-door and zippered compartment for a power line. He brought a fold-out mattress suitable as an extra bed for house guests as his sleep pad. For dinner, we had pesto and fresh bread. I’m clearly not used to this when doing my ultralight backpacking thang! Fortunately, just like in the case of Mt. Adams, the weather cleared in the evening and we were greeted by fantastic weather for our hike. After a standard breakfast of dry oatmeal and a honey gel, which, by the way, was greeted by heckles from the rest of the team, my brother and I headed for the trail at 7am. The rest of the team had things like eggs and ham and other bed-and-breakfast fare and departed, at minimum, 30 minutes later. The departure time, I’ll note, was net of an outhouse shad by my brother (this, I’ll note is very similar to hiking with McL due to his bowel “opportunities”). From here, we hiked the same initial section to the tree line from the previous day. Only thing that I’d note is that the first two miles are extremely mellow and not much more demanding than the worst Marquam or Wildwood trail sections. 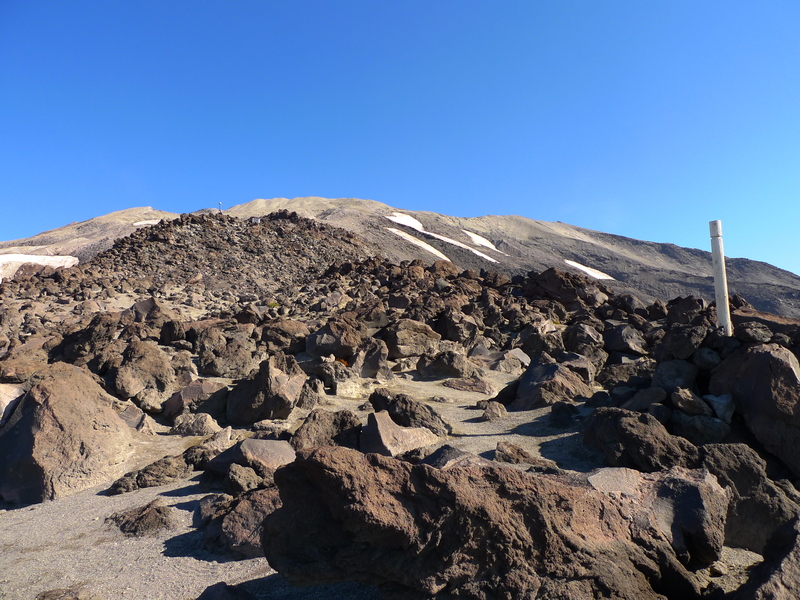 From the treeline to approximately ~1000 vertical feet of the summit, the trail quality quickly degenerated into a boulder scramble for 2 miles. This was pounding and rendered my poles unusable. The trail, if you could call it that, was identified by wooden poles spread regularly up the mountain. There were areas in the valley below the poles that was more trail-like, but it was a bit better to travel over the rocks than through the ash/sand that comprised the trail. After an hour plus climbing up the rock pile, we reached the land of motherscree and ash pie! While certainly not as pounding as I had previously heard, it was a slow ascent from the edge of the rocks to the crater rim. This portion of the ascent wasn’t really lengthy in terms of mileage, but it took some time to make it to the rim’s edge. I would call this section a complete slog! From here, we finally reached the rim at 10:30am. This is where things were the most gnarly due to the fact that the true summit is actually pretty far to the west of the initial arrival position. There were portions where the trail was completely exposed and it would be easy to fall, not into the crater, but down the side of the mountain towards the Dryer Glacier. In addition, there was a steep section of rock to descend, making this the most challenging section of the hike in my opinion. We reached the true summit around 11am and snacked on treats that we had brought. Mine consisted of a Payday bar and some gorp. My brother enjoyed a PB&J sandwich, although I brought several different candy bars to celebrate the occasion! A bunch of people paraded through while we chilled for a half-hour or so. If I were to do this hike again, I’d definitely wear trail runners. 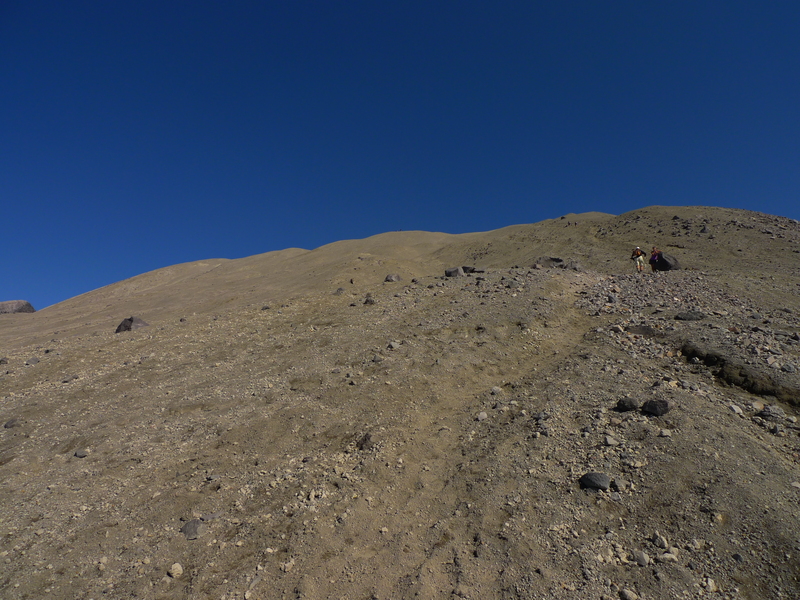 Boots were not required on this hike even with an amount of scree/ash to ford. Gaiters would be a required addition to this setup. I would have made better time had I left my bivy sack, sleeping bag, pad, stove, clothes, and assorted items back at camp. I estimate that my total weight was approximately 15 pounds. While certainly not a technical climb, it was challenging due to the rock field and rim section. I recommend this climb for summer as it would be treacherous during the winter. The summit would be a risky/steep endeavor and one would not be able to approach the rim for fear of snow cornice breakage/risk of a painful fall into the crater. There’s a loop around the mountain called the Loowit Trail. The Wonderland Trail it is not, with a total mileage of 28.62 miles. 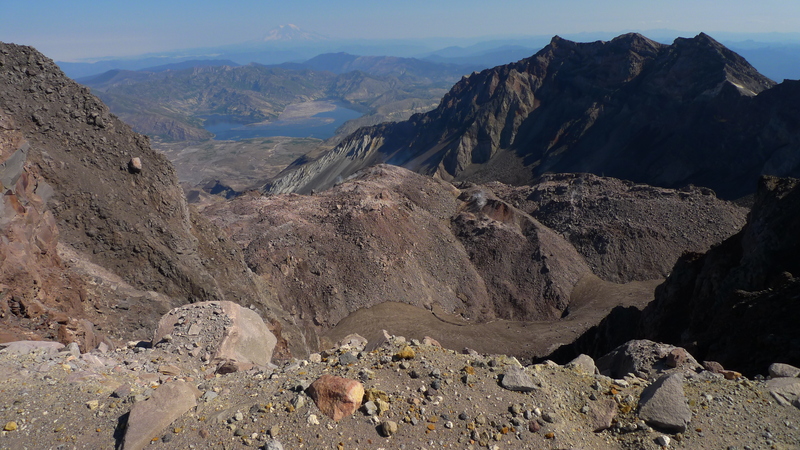 This entry was posted in Mount St. Helens, Mountaineering. Bookmark the permalink.